Burchell writing in his Travels in Africa quoted in George R Jesse’s Researches into the History of the British Dog, Robert Hardwicke, 1866. 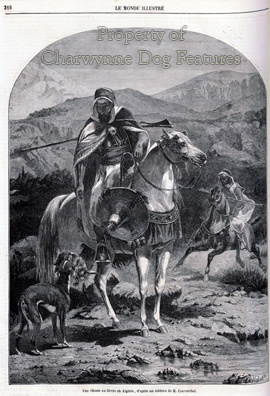 General E Daumas writing in his Horses of the Sahara quoted in George R Jesse’s Researches into the History of the British Dog, Robert Hardwicke, 1866. “A magnificent sloughui arrived a few days ago from Algeria, as a present to the Emperor Louis Napoleon from Marshal de Macmahon the Governor. This splendid animal is the size of a small calf, its colour jet black, marked on the flanks and front with yellow spots; only the Arab chiefs possess them. 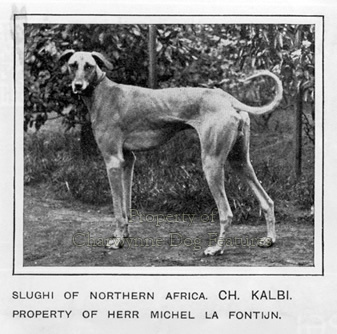 They are used for hunting, their speed being extraordinary, and the sheiks refuse the most brilliant offers for these beautiful animals.” Those words of obvious admiration come from what the author George Cupples termed ‘A modern newspaper account’ in his remarkably widely researched Scotch Deer-hounds and Their Masters, published by Blackwood & Sons in 1894. Those words, and the sentiments behind them, provide a valuable introduction to this breed of hunting dog. The Sloughi, along with the Saluki, has long filled the pots of tribesmen living on their wits in harsh hunting country. For the name of one sighthound breed to sound almost the same as a sister breed doesn’t exactly help discussions about the two breeds. And they are now two distinct breeds: in the pedigree world we have smooth and feathered hounds registered as Salukis, with the smooth-coated Sloughi (from North Africa) listed as a separate breed. The Arabs there however referred to them as mogrebi (magreb) or western. The Tuareg Sloughi, sometimes known as the 'oska', is classified separately in some countries as the Azawakh Sloughi, from the valley of that name in Mali and Niger. This can lead to further confusion as the Azawakh and the Sloughi are separate breeds too. 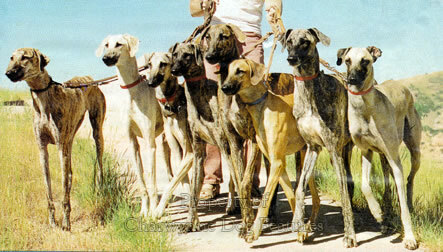 Some historians believe that the sighthounds in Eastern Arabia came from Asia originally, possibly with the invading Hyksos. The Sighthound Club of Germany had DNA tests conducted in 1993 which showed that, of the Afghan Hound, the Saluki and the Sloughi, the biggest genetic difference between is between the Saluki and the Sloughi. The Sloughi was genetically closer to the Afghan Hound. 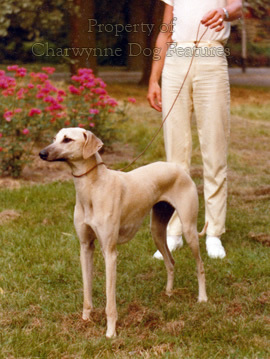 The Sloughi is much more than a smooth Saluki look-a-like. The Moroccan Sahara may well be the last refuge of the true Sloughi, conserved by the nomadic tribesmen of those areas yet unaffected by the remorseless spread of the desert and commercial gazelle-hunting using motorized methods. In the settlements they have been crossed with herding or watchdog types to prevent the ravages of wild pig or jackals. 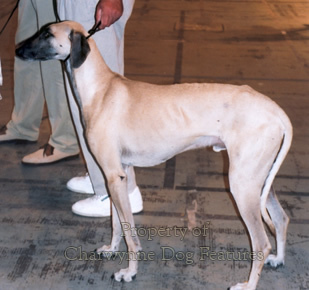 Kennel Clubs separate the breed into two types: the desert type, slender, lightly-built, graceful and elegant, and the mountain type, bigger, stronger, more compact. This has led to a wide height range, from 22” to 28”, although since the breed itself exists in the more remote parts of three sizeable countries: Algeria, Tunisia and Morocco, this is hardly surprising. I have to admit that the first time I saw one, admittedly from a distance, I thought I was seeing a coarsely-bred Greyhound. Then on closer inspection, and after a long most instructive lecture from the handler, I realized that there was, in front of me, a remarkable canine survivor. As with all hunting dogs bred by primitive people, only the very best were bred from and to become the very best they had to cope with a climate and terrain which could not have been more testing. Now they will have to face ‘urban improvement’, veterinary ‘care’ and its annual inoculations, modern convenience dog food and being bred wholly on appearance, each one an apparent kindness, every one a potential threat. Thankfully, the breed has attracted some sensible level-headed fanciers, keen to perpetuate what is a distinctive and admirable breed of sporting dog. I soon realized the essential differences between this breed and its sister sighthound breeds, the Saluki and more importantly the Azawakh, so similar at a glance, so dissimilar in key details. All three breeds have to run fast – for quite a long time, against their most sought-after quarry – the gazelle family. 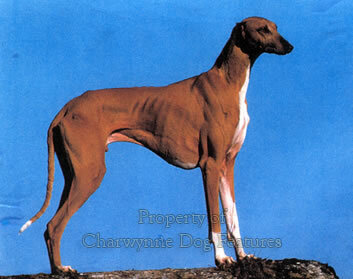 A distinctive feature of the North African sighthounds is the prominent haunch bones. Many Arab hunters will automatically place three or four fingers on the four vertebrae between the hook (hip) and pin-bones to assess the hound’s potential for speed in the chase. Sloughis always look shorter bodied than their Saluki cousins and lack the extremely prominent pin-bones of the Azawakh. 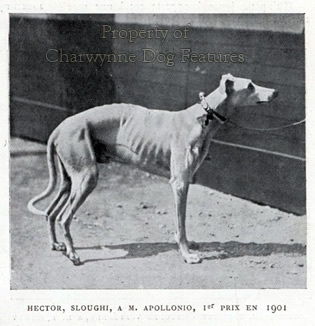 The Sloughi has an almost level topline and moderate angulation in the hindquarters, with flatter less-bunched muscles than say the Greyhound. Magreb Sloughis tend to move with their heads low, with some show ring judges, more familiar with the flashier breeds, questioning the reason for this. For me it’s a more workmanlike gait. The desert-bred Sloughis can feature more than one type of foot, with a wider cat-foot, unusually for a sighthound breed, now being favoured, with well-arched toes and thick pads. The hocks are set low, and, unlike the Azawakh, the tail is carried low on the move. Their gait looks effortless, harmonious and economical. 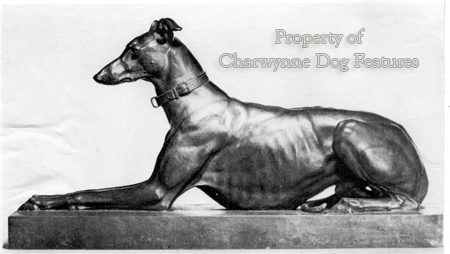 I have read accounts linking these impressive hounds with the Phoenicians, who settled in Carthage in North Africa, opposite Sicily, and were the great trading people in the Mediterranean of their time. Whilst they may have brought their Saluki-like hounds with them from the Syria-Lebanon region, I suspect that the Berbers were hunting with hounds way before then, inhabiting the mountains and deserts of North Afri ca since prehistoric times. I am not suggesting a separate origin for the Sloughi but arguing a history for this type of hunting dog before the Phoenician wanderings. 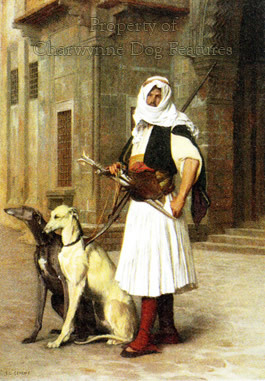 It is however of interest to students of fast hunting dogs that those found in North Africa were drop-eared whilst those on the opposite side of the Mediterranean, from the Spanish islands in the west to the Greek islands in the east, were prick-eared. It could be that the African dogs needed covered ears as protection against sand storms, whereas the southern European hounds used sound much more in the hunting field and benefited from sound-catching bat-like ears in their particular terrain. The latter were however rather more than sighthounds, not just relying on sheer speed and an astonishing ability to spot distant movement, to hunt successfully. The Sloughi is in Britain but not in favour; 20 were registered in 1981, 21 in 2001 but only 8 in 2010, and exactly 0 in 2015. This is a loss of valuable breeding material. They look out of place here, with their fine skin, thin smooth coats and spare build; they perhaps belong within sight of the Atlas Mountains rather than the Cairngorms. I find much to admire in the breed and especially their survival into modern times. They thoroughly deserve devoted patronage and their long term future may reside in the south of France, where Moroccans now live in some numbers and seem anxious to conserve their national heritage. Like the Azawakh of Mali, the Sloughi is a victim of the advance of urban living in the region where it evolved; pastoral communities are under threat and nomads losing their ancestral lands. 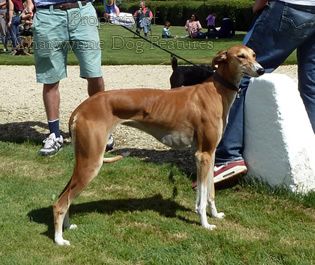 I recently saw what I thought was a Sloughi at a local lurcher show; the resemblance was remarkable but the owner had not used Sloughi stock when breeding this dog. For lurchermen, this breed is of interest; in their homeland, they are expected to locate, stalk, pursue surreptitiously, then chase and seize their prey, rather than just race after it once sprung. They are never expected to kill their quarry, wounded game often being kept alive to retain its food value over time in a hot demanding climate. Slower than a Greyhound and looking less muscular, the Sloughi has greater stamina and certainly greater robustness in extreme heat. 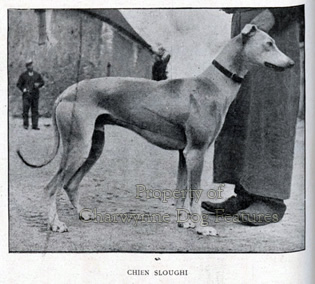 Compared to a Greyhound, the Sloughi is built more on a square than a rectangle and the ears are longer and droopier; white Sloughis are not favoured, but, unlike the Saluki, brindle is. The Saluki has been dubbed the Persian sighthound and the Sloughi the Arab sighthound; despite their obvious similarities, when you see the two breeds side by side, you soon see the two distinct breeds. Sadly, many of these ancient hunting dog breeds will no doubt be lost to us in the coming years and with them will go part of us too.